Leicester City’s owner Vichai Srivaddhanaprabha continue his tradition to change team’s managers, regardless their success. So, Nigel Pearson was told to go one after helping the Foxes to retain their Premier League status. Then, Claudio Ranieri was appointed and Leicester unpredictably won the title. Afterwards, with Leicester fourth bottom and following a locker room’s rebellion, Ranieri has been sacked while his assistant coach Craig Shakespeare was put in charge of the team. Now, Shakespeare too has been fired in a typical example of history repeating itself. Shakespeare’s demise – who left Leicester’s players “cheesed off”, according to caretaker manager Michael Appleton – hardly comes as a big surprise due to Leicester’s poor results and with the team on the wrong side of the table. That said, this layoff happens after just fourth months since the 53-year-old took the job and with the current season just at its beginning. Clearly, eight games into this campaign was enough for Thai owners which are not ready to sustain another underperforming year. So, Srivaddhanaprabha family acted, unconcerned about Shakespeare’s popularity among media and fans as they were more worried about team’s lack of results as Leicester won only one of the 11 league matches they played under former Ranieri’s assistant. The same players – which supported club’s decision to replace Ranieri with Shakespeare last season – were surprised as they have been impressed with the way Shakespeare managed the team with his overall approach. That wasn’t enough as Leicester’s failure to beat West Bromwich Albion sealed Shakespeare’s fate. Surely, you can highlight the fact that Foxes’ bad ranking is largely due to a schedule that forced them to face Arsenal, Manchester United, Chelsea and Liverpool in their first six games of the season. But Shakespeare’s side also played against more winnable Huddersfield, Bournemouth and West Bromwich Albion and they still wasn’t able to beat them. There is a reason why the Foxes are in the bottom three. Paradoxically, Crystal Palace’s decision to part ways with Frank de Boer has been more surprising as the Dutch wasn’t given the due time to install his philosophy at Selhurst Park. Instead, Shakespeare has been not hired to change Leicester’s football philosophy or to implement a new brand of football. He was hired by Vichai Srivaddhanaprabha to simply normalize and take charge of a locker room tired of Ranieri’s methods – despite the success they enjoyed under the Italian gaffer. Time wasn’t due to Shakespeare in order to make the job done and the Srivaddhanaprabhas felt the same as the results lacked over there. The new signings they brought on also didn’t work. Leicester signed Nigerian forward Kelechi Iheanacho out from Manchester City but the player has been plagued by injuries. Sevilla captain Vicente Iborra too suffered a groin problem leaving former Hull defender Harry Maguire as the only newcomer to make a decent impact with the first team so far. Still, Shakespeare enjoyed success last season after replacing Ranieri. He did it by turning the Foxes back to basics and doing the simple things after Ranieri tried to keep things up-to-date with a series of newness about tactics and lineup. 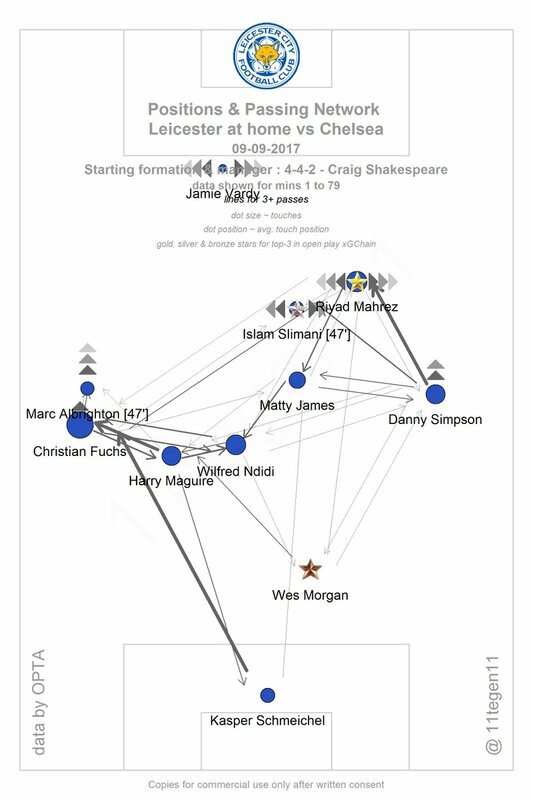 First and foremost, Shakespeare reintroduced a defensively oriented 4-4-2/4-4-1-1 with Jamie Vardy as lone forward up top. Then, to replace the departed N’Golo Kante, he brought on Wilfried Ndidi to play alongside Danny Drinkwater in the middle of the pitch. The Foxes immediately regained the balance they had lost after Kante was sold to Chelsea. In fact, while Ranieri’s attempt to replace the Frenchman had left Leicester’s centre-backs Wes Morgan and Robert Huth exposed, Shakespeare’s decision to pair Ndidi and Drinkwater as holding midfielders gave team’s backline extra protection. So, running this way, Shakespeare was able to revert Leicester in an efficient counter-attacking side. And it worked since the first team under him as the Foxes beat Liverpool 3-1 following a game in which they registered merely a 31% of ball possession. The classic counter-attacking 4-4-2 suited the team and Shakespeare stayed faithful to it. But things have gone south this campaign as some weakness of their 4-4-2 have been exposed. It stats in the middle of the field where Drinkwater wasn’t well replaced. Leicester’s defensive efficiency suffered as the Foxes allowed 16.5 shots per game. They registered just two clean sheets and allowed 13 goals (fifth worst EPL defence) with an average of 1.6 per game while their differential between for and against expected goals on open play is -3.02 with their xGA being 9.38. Expected goals difference (xGD) is the difference between expected goals for and expected goals against. A counter-attacking side caught on the counter. Some pundits also remarked as Shakespeare’s side played too deep this season and it made hard for them to properly climb the field on counter-attacks when the ball is won. Moreover, stats tell us the opposite. In fact, although Shakespeare’s two holding midfielders showed some lacks when in possession – for example, Ndidi, who’s able to chase the ball for the whole game and who averaged 4.4 tackles per game, registered only 70.2% in pass completion – Leicester still produced 16.5 shots per game and their xG are 11.23, sixth best in Premier League. For a better understanding of Leicester’s unbalanced run under Shakespeare, just take a look to the game against Chelsea as an example. The below pass map provided by the efficient @11tegen clearly showed as the Leicester’s 4-4-2 worked when in possession with the Foxes able to move the ball through the flanks in order to connect them with the forwards up top. On the other side, you can see as centre-back Morgan stayed too deep lowering the backline. 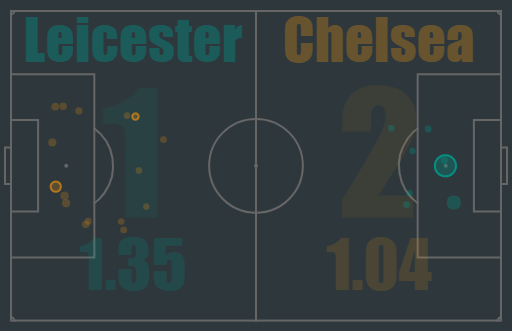 Furthermore, the xG stats show us how the Foxes have been more dangerous – albeit slightly – than Chelsea. It confirms as Leicester faced troubles when out of possession under Shakespeare’s regime. This determined Shakespeare’s dismissal despite the fact former manager posted the second-best winning percentage between all team’s Premier League managers (38.1, just behind Ranieri’s 44.4).